And so, a fitting conclusion to tonight's Doctor Whoadventure, "Snakedance." I have so much good news, I don't quite know where to begin, but let me say that you don't have to wait a week to see the next Doctor Whoadventure, you have to wait less than twenty-four hours, for tomorrow night-- well, actually, tonight, since this is Monday --tonight,at 11:00, the next Doctor Whoadventure, "Mawdryn Undead." More on this subject of a whole week of Doctor Whoin just a moment. First, let me tell you that we have on duty right now, in a secret place, far from here, but nevertheless viable and efficacious, a group of operators who want to take your subscription to Channel 11. And all you have to do to subscribe and help assure the continuation of the Doctor Whoseries on this station, is to call them... with your subscription at [number deleted]. How much should you subscribe? As much as you can, whatever you can afford, what you think Channel 11 is worth to you, what you think Doctor Whois worth to you. With some of you, it may be a dollar or two. With others who can afford a little more... or a lot more... we have some premiums we'd like to show you. This one, you've undoubtedly seen before. We've offered it for a little while. It is the... Doctor Whoalbum, containing music from many of your favorite Doctor Whoepisodes, and containing the pictures of five of the men who have portrayed Doctor Who. 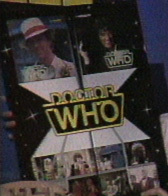 The other side of the album... has a representation of the TARDIS and the selections it contains. It comes in a clear, plastic envelope because, as you can see, on this unusual record, all the information is pressed right into the vinyl itself. That is yours with a $50 subscription to Channel 11. If you can afford a $75 subscription... you might be pleased to receive this collector's edition, two-record set. This is new to us. We first offered it earlier this evening; we'll have it for some time, we trust. One album contains Doctor Whosound effects. A lot of them: eight on one side, twenty-two on another, all listed, the effects themselves and the shows they're from. The other record contains a complete radio[sic] production of "Genesis of the Daleks." Within, you can see a number of... pictures-- seven of them, I think. Various Doctor Whophotos from various programs. And that's not all this album contains. ...there is also this poster, which contains, uh, as you can see, shots of-- at the top --of Peter Davison and Tom Baker, the other Doctors Who down here at the bottom, along with, uh, some of your favorite villains, monsters, as well as, uh, K-9, Peter Davison in the TARDIS, the Cybermen, the Zygons, Davros, and a sole Dalek. All of this comes to you in this special bonus Doctor Whopackage with a $75 subscription. One caution: if you receive a busy signal when you call this toll-free number-- and you may; we get a very good response from you fans of Doctor Who--if you get a busy signal, wait a few minutes and try again, or even try an hour later, or tomorrow morning. They'll be there to take your subscription. Now, I was going to tell you about the other programs this week. Tonight, Monday, "Mawdryn Undead"; Tuesday night at 11, "Terminus"; Wednesday, "Enlightenment"; Thursday, "King's Demon" [sic]; Friday, "Warriors of the Deep." A complete Doctor Whoadventure every night this week. Enjoy them all, and keep your subscriptions coming to Channel 11, to help keep Doctor Whocoming to you. Call us now at our toll-free number.